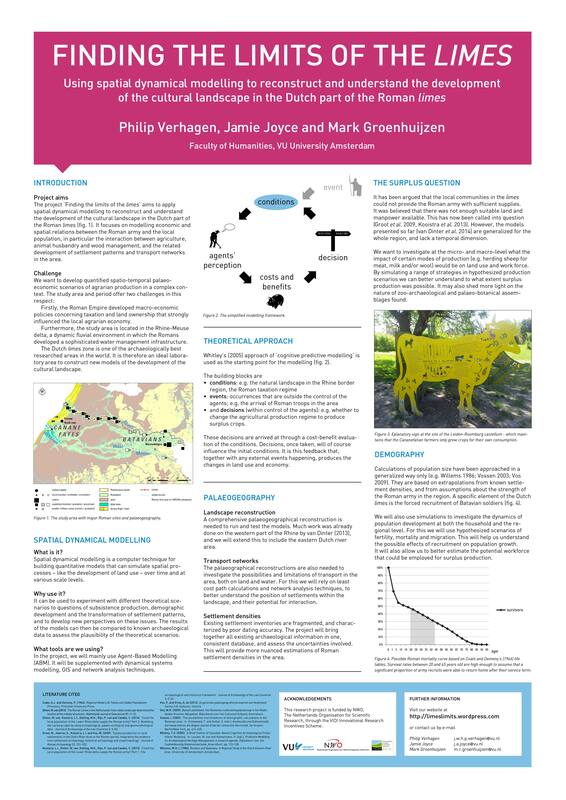 The ‘Finding the limits of the limes’-project aims to apply spatial dynamical modelling to reconstruct and understand the development of the cultural landscape in the Dutch part of the limes zone during the Early and Middle Roman period (ca. 15 BC – 270 AD). It focuses on modelling economic and spatial relations between the Roman army and the local population, in particular the interaction between agriculture, animal husbandry and wood management, and the related development of settlement patterns and transport networks in the area. The ambition is to develop quantified spatio-temporal palaeo-economic scenarios of agrarian production in a complex context. The study area and period offer two challenges in this respect. Firstly, the Roman Empire developed macro-economic policies concerning taxation and land ownership that strongly influenced the local agrarian economy. Furthermore, the Dutch part of the limes zone is located in the Rhine-Meuse delta, a dynamic fluvial environment in which the Romans developed a sophisticated water management infrastructure. An integral analysis of the socio-economic system in that area therefore has to consider all the local, regional and supra-regional factors involved in economic development. The interaction of environmental, economic and socio-cultural factors must also be examined. The Dutch limes zone is one of the archaeologically best researched areas in the world. Consequently, a rich set of archaeological and palaeo-environmental data has been collected over the past decades. It is therefore an ideal laboratory area to construct new models of the development of the cultural landscape. and spatial analysis of settlement development and interaction using GIS and network analysis techniques. All these analyses will be done at various spatial scales (household, settlement, micro-region and region). The modelling components will rely on agent-based modelling as a primary tool to better understand the underlying processes of settlement and land use development in space and time. However, equally important will be the construction of a complete and reliable archaeological data set of the region for purposes of testing the models and facilitating further research. In this way, the project aims to connect the empirical and theoretical angles of research in the area, and to provide more insight into the uncertainties of data sets as well as interpretational frameworks.